The Lifestyle Hub: The Teen Queen Sings Jazz! The Teen Queen Sings Jazz! From teen roles to appreciating jazz at 24, Renee Olstead will prove to us why music, regardless of genre, is a universal language. See you at her concert in EDSA Shangri-La on March 29. She was not born yet when George and Ira Gershwin wrote "Someone To Watch Over Me" for the musical "Oh Kay!" in 1926. You can do the math but Renee Olstead (pronounced Re-ney Ol-sted) is just turning 25 on June 18. But when she sang one of my favorite classic songs (blame it to singing parents and Katherine McPhee in American Idol Season 5), Renee transported the members of the press to eight decades back in just one chorus. If the time travel happens so fast for you, let's get to know this American actress and singer a little bit more. Renee had two memorable TV roles, as Lauren Miller in "Still Standing" (CBS, 2002- 2006) and as Madison Cooperstein in "The Secret Life of American Teenager" (ABC, 2008- 2013). In 2004, she was Becky in the Jennifer Garner film "13 Going to 30". With all those teen-themed screen works mentioned, you might wanna ask, why jazz? At yesterday's press conference for her upcoming concert at the E Bar in EDSA Shangri-La, I had the opportunity to ask Renee that question. She explains Jazz is the same as other musical genres which traces its roots several decades ago. Even pop existed as early as 1920's she said. Though jazz didn't thrive in the same level as pop in the recent years, Renee assured that musically-talented kids should not be intimated with what they consider sometimes as a more challenging piece of music. "We need to let the kids know that it may not be popular but it's something that they shouldn't be afraid to try." With her voice now part of eight studio albums including the official soundtrack of The Princess Diaries 2: The Royal Engagement and her solo albums Renee Olstead in 2004 and Skylark in 2009, Renee admitted that until now she is still learning some things new about jazz. It's still a wonder though how jazz has bridged different generations but the 24 year-old singer declares that her musical inspiration is the 60's musical genius Etta James. I hope I was able to spark your interest in knowing jazz and Renee Olstead a little better. 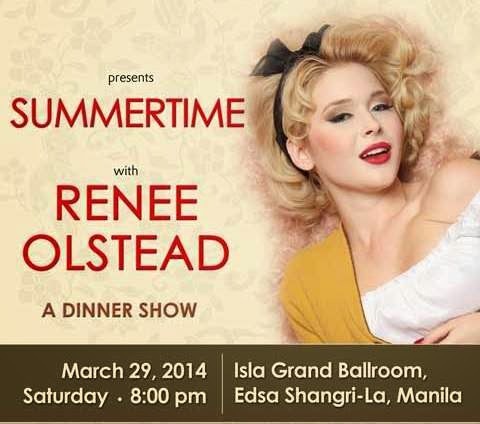 For those who are unfamiliar, you may join Renee at her dinner concert dubbed "Summertime" at Isla Grand Ballroom of EDSA Shangri-La on Saturday, March 29 at 8PM. Tickets are priced at PhP7,000, PhP6,000, and PhP5,000. You can call 633- 8888 local 2895 for reservations. Here's Renee Olstead's video of "Someone To Watch Over Me"